No single endeavor has marked the image of Texas in the national mind more than the cattle drive. For more than a century, writers have romanticized the work and the life of the cowboy. Cattle have been raised in Texas from the time the Spanish attempted to establish missions and domesticate the Indians, beginning in the mid-18th century. It was primarily a small-scale industry during the Republic and early statehood. Most cattle were slaughtered for their hides and tallow, since the meat could not be preserved for long with the methods then used. Many of the early cattle were longhorns, descendants of Spanish ranch and mission herds, with horn spreads of four to eight feet. Some had become crossed with Mexican cattle, shorter-horned and dun-colored. But there also were cattle of British origin, brought west by Anglo-American colonists from the East Coast by way of Northeast Texas. Early cattle drives headed west to the California gold fields after 1850, when cattle worth $5 to $10 a head in Texas would garner five to 20 times that amount in San Francisco. Most drives to California took five or six months. Cowhands gather 'round a chuckwagon on the JA Ranch in Palo Duro Canyon in 1898. Panhandle-Plains Historical Museum. Starting in the vicinity of San Antonio or Fredericksburg, many drives followed a southern route through El Paso to San Diego or Los Angeles and on north to San Francisco. These drives slowed by 1857, as the cattle market in California reached a glut. By 1859, only a trickle of cattle moved to the West Coast. After gold was discovered in the Rocky Mountains, some cattle were driven to the gold fields there, starting about 1858. Some ranchers held contracts to supply beef to frontier forts and to Indian reservations in West Texas, Oklahoma and New Mexico beginning in the late 1850s. Cattle ranching virtually halted during the Civil War years, as the frontier retreated. Beginning in 1866, however, ranching – and cattle trailing – expanded rapidly. Before the widespread use of fencing to separate cattle herds belonging to different owners, cowmen used brands and earmarks to identify their cattle. The use of brands to identify domestic cattle is an age-old practice. Burning identifying marks into the hides of animals and cutting a distinctively shaped piece out of one ear of each head of livestock were, until the relatively recent use of tattoos, the only methods of marking that would last the lifetime of the animal. The practice came to this country with the first Spanish. In Spanish Texas, brands and earmarks were registered in brand books maintained by the ayuntamientos, or municipal councils. After 1778, the provincial government in San Antonio maintained an official brand book for all of Spanish Texas. Brands on the early Anglo-Texas frontier were at first applied with "dotting irons," which required several applications to get an entire brand. There were basically three shapes of dotting irons: a straight line about three or four inches long, a small half-circle and a large half-circle. To make a "D," for instance, the straight line would be used vertically, then the large half-circle would be applied to form the curved part of the letter. Later, the more familiar stamping iron was used, in which the entire brand was placed in one application. After 1848 in Texas, the brand and earmark of each rancher could be registered with the county clerk, and theft of cattle with unregistered brands would not be prosecuted. Cattle drives to northern and western markets, and later to railroad-loading facilities, started in earnest in 1866, when an estimated 260,000 head of cattle crossed the Red River. The drives were conducted for only about 20 years, becoming unnecessary with the advent of the railroads and refrigeration in the 1880s. Cattle drives usually began in the spring after roundup, as grass was available then and the herd could be delivered to its destination in the north before cold weather set in. Livestock from several different owners was usually included in a trail herd. The trail boss obtained documentation from each rancher noting the owner's brand, earmark and number of cattle. Then all animals in the drive were branded with the same road brand, regardless of ownership. A 12-man crew could manage a herd of 2,000 to 3,000 head. The trail boss was the ultimate authority on the trail, like the captain of a ship, and was paid $100 to $125 a month. Of the rest of the crew, the cook was the most important, earning about $60 per month. Legendary ranchman and trail driver Charles Goodnight invented the chuckwagon in 1866 for use by his crews. The chuckwagon, sometimes drawn by oxen, but usually by mules, carried not only food, utensils and a water barrel, but also tools and the crew's bed rolls. A fold-out counter, supported by one or two hinged legs, was used for food preparation. The wagon contained several drawers and shelves, with a "boot" or storage compartment underneath, all covered by a canvas top. The cook served beef and bison steaks, SOB stew (made from calf parts), "chuckwagon chicken" (bacon), "Pecos strawberries" (beans), "sourdough bullets" (biscuits) and cowboy coffee. There were nine or 10 wranglers and drovers – sometimes called "thirty-dollar men" – per crew. The wrangler managed the herd of spare horses, known as the remuda, made up of eight or 10 horses for each man. The remaining drovers were appointed to their posts along the line of cattle in the drive. Cattle do not trail in a group, but strung out in a long line. Several natural leaders usually take their places in front, while all the others fall into an irregular line behind them. A herd of 1,000 head might stretch out one to two miles on the trail. The drovers worked in pairs, one on either side of the line of animals. The best of the men were usually assigned to be "pointers," working near the head of the line. The remainder of the men worked the flank and swing positions farther back, with drag men bringing up the rear. Communication was by hand signals, adapted from Plains Indian sign language, or gestures with hats. The drive would cover about 10 to 15 miles a day and, depending on what delays were encountered, a drive to western Kansas would take between 25 and 100 days. On the Western Trail, through Fort Griffin, Comanches and Kiowas were threats until they were finally defeated and driven onto their reservations in Indian Territory. Other hazards included delays caused by flood-swollen rivers or, during droughts, thirsty animals becoming crazed at the smell of water. The major cause of stampedes was lightning, but the herd could be spooked by any number of sights, smells and noises. To stop a stampede, the drovers nearest the head of the herd would get in front of the leaders and turn them to the right, causing them to move in a circle, then bring the rest of the herd into the circle as they approached. The riders would then make the circle smaller and smaller, until the entire herd was moving slowly in a tight circle. When calves were born on the trail, the early practice was to kill them, because they could not keep up with the herd on their own. When calves came to have cash value, Charles Goodnight had a wagon made that would hold 30 to 40 calves. Any calves born on the trail would be picked up by the cowhands and put on the wagon for the day's drive. At night, they would be turned out with their mothers. A cow knows her calf by its smell, and Goodnight found that when he had several calves on the wagon, their scents got mixed. So he had his cowboys place each calf in a sack and number the sacks so that the same calf went into same sack each morning. They spent the day in sacks on the wagon and spent the night with their mothers. While on the trail, the Goodnight outfit made use of home remedies for illnesses. Coal oil was used to combat lice, and prickly-pear poultices were thought to help wounds heal. Flowers of the bachelor's button plant were used to cure diarrhea, salt and bison tallow were used for piles, and bison-meat juice was drunk as a general tonic. The first cattle drives from Texas on the legendary Chisholm Trail headed north out of DeWitt County about 1866, crossing Central Texas toward the markets and railheads in Kansas. The trail was named for Indian trader Jesse Chisholm, who blazed a cattle trail in 1865 between the North Canadian and Arkansas rivers. That initial trail was expanded north and south by other drovers. The trail was not one fixed route. As one historian remarked, "trails originated wherever a herd was shaped up and ended wherever a market was found. A thousand minor trails fed the main routes." Roughly, the Chisholm Trail went from the Rio Grande near Brownsville through Cameron, Willacy, Kleberg, Nueces, San Patricio, Bee, Karnes, Wilson, Guadalupe, Hays, Travis, Williamson, Bell, McLennan, Bosque, Hill, Johnson, Tarrant, Wise and Montague counties. It crossed the Red River and continued to Dodge City and Abilene, Kans. Another popular route approximately paralleled the main trail, but lay farther east. Fixed points on the trail, which all the drives on the Chisholm Trail used, were the crossing on the Colorado River near Austin; Brushy Creek near Round Rock; Kimball's Bend on the Brazos River; and the Trinity Ford in Fort Worth below the junction of the Clear and West forks. The peak year on the Chisholm Trail was 1871. After interstate railroads came to Texas in the mid-1870s, trailing cattle to the Midwest became unnecessary. The Chisholm Trail was virtually shut down by the 1884 season. The Goodnight-Loving Trail was one of the first of the post-war trails to be blazed across part of West Texas. Charles Goodnight established a herd of cattle in the Keechi Valley of Palo Pinto County in the late 1850s and ranged his cattle across Palo Pinto, Parker and Young counties. After serving in the frontier militia during the war, Goodnight rounded up his cattle in the spring of 1866 and headed for the Rocky Mountain mining region. To avoid Indians, he decided to use the old Butterfield stagecoach route to the southwest, follow the Pecos River upstream and proceed northward to Colorado. This route was almost twice as long as the direct route, but it was much safer. While buying supplies for this trip, he encountered Oliver Loving, and the two decided to join forces. The combined herd numbered about 2,000 head when they left their camp 25 miles southwest of Belknap on June 6, 1866. Their route took them past Camp Cooper, by the ruins of old Fort Phantom Hill, through Buffalo Gap, past Chadbourne, and across the North Concho River 20 miles above present-day San Angelo. They crossed the Middle Concho and followed it west to the Llano Estacado, crossed New Mexico and proceeded to Denver. With this drive, the Goodnight-Loving Trail was born. Goodnight and Loving used this trail several times before Loving was mortally wounded in an Indian attack in New Mexico in September 1869. Just before he died, Loving made Goodnight promise to see that he was buried in his home cemetery in Weatherford. Loving's remains were temporarily interred in New Mexico while Goodnight and his outfit completed the drive. Returning to New Mexico, Goodnight had his cowboys flatten out all the old oil cans they could find and solder them together to make a tin casket. Loving's remains were placed into a wooden coffin, which was then put inside the tin casket. Powdered charcoal was packed between the two containers, and metal lid was sealed, and the whole contraption was crated and transported to Weatherford for burial. Loving's grave in Weatherford's Greenwood Cemetery has a Texas state historical marker. Soon after the cattle drives began, stockmen and farmers in Missouri, incensed at outbreaks of "Texas fever," demanded that Texas cattle be banned from the state. Although called Texas fever, the tick-borne splenetic fever was first noticed in Pennsylvania as early as 1796, when cattle from the South were introduced. In the early 1800s, cattle from Georgia and South Carolina were banned from Virginia and North Carolina because they carried the disease. Texas fever was noticed in Arkansas and Missouri after cattle from Texas were driven through in the 1850s, but since the Texas cattle remained healthy, their role as the carrier of the disease was discounted at first. But the rangy, tough longhorn was immune to Texas fever; cattle in other states were not. When the South Texas longhorns were trailed through, the ticks dropped off and found local cattle to feed on, transmitting the deadly disease. Some cattle drives from Texas were met with armed mobs in southeast Kansas, southern Missouri and northern Arkansas. Even Texas cattlemen, principally Charles Goodnight and other Panhandle ranchers, posted cowhands armed with rifles at the southern boundaries of their lands to keep out tick-infested South Texas cattle, in what has come to be called the "Winchester Quarantine," in honor of the weapon used to enforce it. It was not until 1889 that researchers isolated the tick Margaropus annulatus as the carrier of Texas fever. An immunization was finally developed in 1899 by Dr. Mark Francis, head of the veterinary school at Agricultural and Mechanical College of Texas, now Texas A&M University. By the turn of the century, a dipping process to rid the cattle of ticks had been developed and was widely used. When Missouri banned Texas cattle, thus putting the Sedalia trail off-limits to drives originating in Texas, the trails moved west to go through Kansas Territory, and as settlement in Kansas moved ever westward, the cattle trails were pushed before them. As the cattle drives were pushed westward, many trail bosses started using the Western or Dodge City Trail, also called the Fort Griffin Trail. It became the principal route north after 1876. Several feeder routes from the south merged at Fort Griffin, then proceeded northward through Throckmorton, Baylor and Wilbarger counties, leaving Texas at Doan's Crossing on the Red River in Wilbarger County. Other major trails crossed other areas of the state. The wily merchants of Fort Griffin sent a representative to Belton to intercept cattle drives to persuade the trail bosses to use the Western Trail, thereby bringing more business to Fort Griffin. Cattle prices increased fairly steadily from 1866 through 1870. As a result, the 1871 drive to Midwestern markets was the largest ever: 700,000 Texas cattle were driven to Kansas alone. But in 1871, the general economy was slack, and there were few buyers. Half the cattle remained unsold and had to be wintered on Kansas ranges at great expense. The drive in 1872 was only about half that of 1871. The financial Panic of 1873 forced some cattlemen into bankruptcy. In some cases, cattle shipped to market that year did not sell for enough to pay shipping expenses. Farmers were pushing cattle into ever-more-arid parts of the country. The era of the cattle drive was at its peak for only about 20 years – from after the Civil War until the coming of the railroads to Texas made the long trek to northern markets unnecessary. But it has left us with a legacy of images that will be with us for generations: of sun-burned cowboys in their distinctive chaps and wide-brimmed hats, of clouds of dust kicked up by bawling cattle, of the wheeling and darting quarter horses keeping the critters in line, of the crusty chuckwagon cook making biscuits in a Dutch oven over an open fire. The cattle drive, more than any other entity, epitomizes the romanticism of the "Old West." 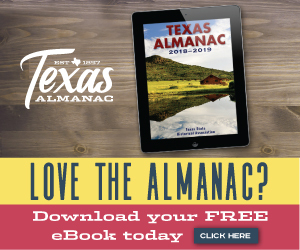 — written by Mary G. Ramos, editor emerita, for the Texas Almanac 1990-1991.